They believe it's the most influential trend that's transforming the mainstream business arena. 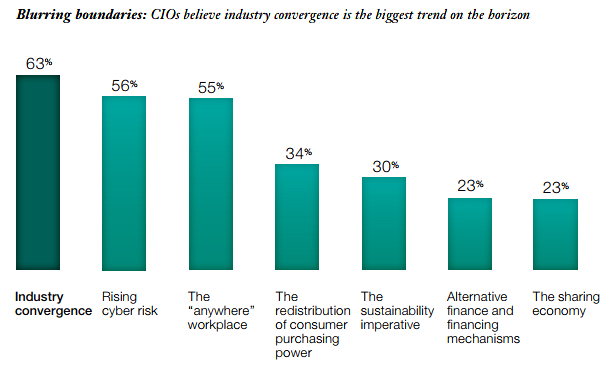 Those deemed to be the ‘Torchbearer’ CIOs are particularly attuned to the shift -- in fact, a full 79 percent of these IT leaders expect industry convergence to have a significant impact. 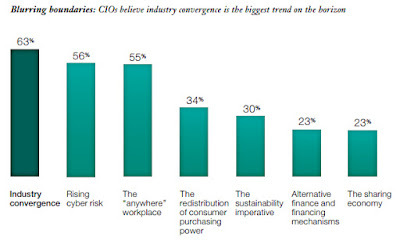 That said, only 57 percent of CIOs are reassessing their strategic direction. Many of the infrastructure decisions the IT department makes are no longer purely about technology -- they’re now considered core components of an organization’s essential business strategy. Progressive CIOs have another significant thing in common; they know how to maximize their investment in legacy IT systems, and apply that solid foundation with the adoption of new platforms that -- when combined -- enable them to achieve superior transformation results. Forrester believes that integrating established apps with smaller new services will advance the mainframe environment towards faster application delivery, even greater scalability, and better overall manageability. They describe this evolved hybrid IT state as the ‘Systems of Innovation’ that so many CIOs apparently crave.